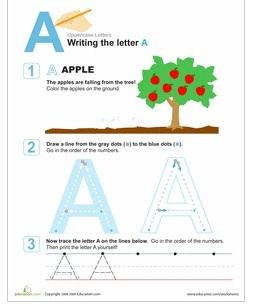 Education.com has a great series of alphabet worksheets. A-Z right there for you to download and use, for free! Learn all about the letter A! Color the apples that have fallen from the tree. Then connect the dots to practice writing capital A’s, and then try doing it on your own! This worksheet helps your preschooler develop fine motor skills, which are an important part of learning to write. Click HERE for link to pages.